*Pony rides and Lessons will resume approximately the first week of May, depending on weather, arena conditions and footing. *Note: Li'l critters have temporarily been moved to the main barn to keep cozy and warm in the cold months. They'll be back in the spring! $20 per 20 minute Ride & Groom or Ride Only. ​Helmets provided. Closed shoes required. By appointment only (no walk ins). We require cash, check or money order ONLY for payment in full at the time of your visit. Credit cards not accepted at this time. Staff does not carry change, so please bring exact amount. Note: Currently, we do not take our horses or ponies off-site. 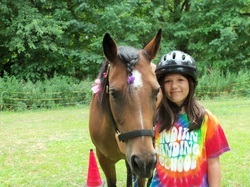 All pony rides, parties and events are held at the stables. Lessons are available weekly for children ages 2 and up. Private lesson includes instruction from the heart with one of our gentle horses or ponies and a nurturing, creative instructor who will help children learn in a fun and relaxed environment. Children will enjoy learning how to handle and communicate with a horse or pony, understanding horse care, grooming and tacking (getting your horse ready for riding) and learn basic riding skills, including games on horseback, instructional trail riding and a variety of exciting things you can do with your horse! *Please call ahead for availability, as our instructors currently have a full schedule and availability may be limited. Click Contact Us for information and to book lessons.